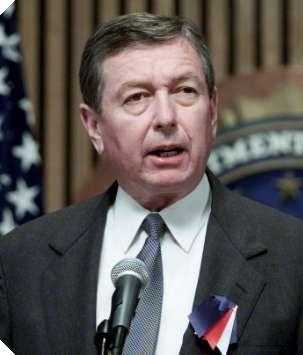 The Nerve Of "The People"
Last May, Attorney General John Ashcroft made a statement that news reports almost unanimously described as "controversial." In a letter to NRA Executive Director James Jay Baker, Ashcroft wrote, "[L]et me state unequivocally my view that the text and the original intent of the Second Amendment clearly protect the right of individuals to keep and bear firearms." The response from gun control activists was as predictable as it was arrogant. Dennis Henigan of the Center to Prevent Handgun Violence huffed, "It is astonishing that our nation's chief law enforcement officer would have such a grossly misinformed position on a fundamental constitutional issue. A related website called Ashcroftandguns.com shrieks that his position is "extreme and wholly discredited." Obviously, the source of the controversy is that Ashcroft has based his opinion on the actual words that appear in the Constitution. No wonder the deep thinkers in the gun control movement find him simplistic, if he's going to be gullible enough to trust words to tell him what they mean. The Second Amendment says, "A well regulated Militia, being necessary to the security of a free State, the right of the people to keep and bear Arms shall not be infringed." To take this to mean that individuals have a right to keep and bear arms breaks one of the most fundamental rules of liberal jurisprudence, in that it requires the audacity to believe that you can read and understand the Constitution for yourself, instead of waiting for it to be translated beyond recognition by a Democrat-appointed judge. By taking the Second Amendment literally, Ashcroft simplistically understands the word "people" to mean the plural of "person." He therefore believes that each individual person has a right to keep and bear arms. The Clinton administration interpreted the amendment a bit more creatively, asserting that it indicates a "collective right" to which a person is not entitled unless he is part of the collective. Leave it to Bill Clinton and Janet Reno to define "people" the same way as in "The People's Republic of China." The Clinton position is allegedly rooted in the 1939 Supreme Court case of United States v. Miller, which upheld the National Firearms Act of 1934. The Firearms Act was America's first gun control law, aimed at curbing the production and transportation of guns that were commonly used by mobsters. The law had been challenged by a man named Jack Miller, who had been arrested at the Oklahoma-Arkansas border, for possession of an unregistered sawed-off shotgun. The Court denied Miller's claim that the arrest violated his Second Amendment rights, concluding that, "In the absence of any evidence tending to show that possession or use of a 'shotgun having a barrel of less than eighteen inches in length' at this time has some reasonable relationship to the preservation or efficiency of a well regulated militia, we cannot say that the Second Amendment guarantees the right to keep and bear such an instrument." Whereas the Court decided that the term "Arms" in the Second Amendment only includes weapons consistent with those which might be used by militias, the Clinton Justice Department extrapolated that ruling to mean that only active militiamen (which they translate as meaning the National Guard) have a right to own firearms. The former of these two arguments is debatable; the latter is not. Leading celebrity gun control activist Rosie O'Donnell likes to remind us that there are 27 words in the Second Amendment, and that we need to read them all -- her point being that gun owners often quote the last part, while omitting the reference to "a well regulated Militia." She might, however, take note that among those 27 words, not one of them is "if." The first clause of the Second Amendment places absolutely no conditions on the right to keep and bear arms. To the contrary, it serves to emphasize the importance of respecting that right. The Second Amendment does not say, "If a well regulated Militia were necessary to the security of a free State, the right of the people to keep and bear Arms could not be infringed." It begins instead, "A well regulated Militia, being necessary to the security of a free State ..." As far as the Constitution is concerned, the necessity of a militia is not a matter that's open for discussion. It is a plain and unqualified fact. And because it is so, "the right of the people to keep and bear Arms shall not be infringed." Not the right of the government, not the right of Rosie's bodyguards, but the right of the people. Although the "Militia" that is mentioned in Article I Section 8 of the Constitution does bear some general similarities to the National Guard, its definition is much broader. The Militia is an extension of our national defense to the entire citizenry. It means that in times when the U.S. is threatened by invasion or insurrection, every American is, in a sense, drafted. That should be obvious to us today, when President Bush is asking us all to remain vigilant against terrorists walking among us. Since September 11th, the number of gun sales and applications for concealed-carry permits has boomed. If gun-control activists' tiresome warnings about turning America into the OK Corral had any merit, the streets would now be awash with blood. To the contrary, most citizens who've taken up arms have conducted themselves with the same sober deliberation as their Commander in Chief. That's the American militia in action. Don't believe it? Maybe you'll believe Richard Henry Lee, the man who introduced the resolution for American independence to the First Continental Congress. In his Additional Letters from a Federal Farmer, published in 1788, Lee wrote, "Militias, when properly formed, are in fact the people themselves and include all men capable of bearing arms. To preserve liberty it is essential that the whole body of the people always possess arms and be taught alike, especially when young, how to use them." Our founding fathers were not purveyors of postmodernism. When they said "the people," they meant the people. What's more, when they used that word multiple times in the same context, it meant the same thing every time. Just think what this must mean if we are to accept the Clinton-Reno explanation of the Second Amendment. When the First Amendment recognizes "the right of the people to peaceably assemble, and to petition the government for a redress of grievances," that must mean that the government has a right to assemble groups of people, but individual people don't have a right to just arbitrarily go around assembling on their own. We, not being "the people," don't even have the right to demand that the government explain why it would reserve a right to petition itself. When the Fourth Amendment guarantees, "[t]he right of the people to be secure in their persons, houses, papers, and effects, against unreasonable searches and seizures," that's meant to prevent mere individuals from poking their noses into government business. Only a simpleton would take it to mean that the collective "people" are forbidden from protecting you from all the dangerous things in your house. There can be no such things as collective rights, for collectivism, by definition, is a nullification of rights. The entire point of drafting a Bill of Rights was to assure that the government couldn't deprive the people of certain fundamental, God-given freedoms, in the name of some greater good. To suggest that any amendment within the Bill of Rights is meant to empower an intra-governmental collective is nonsense. Thankfully, the Fifth Circuit Court of Appeals seems to agree. In October, it upheld a lower court ruling that acknowledged the Second Amendment as a right held by individuals. Better yet, it pointed out that U.S. v. Miller had never contradicted that point. The Circuit Court concluded: "[W]e hold, consistent with Miller, that it [the Second Amendment] protects the right of individuals, including those not then actually a member of any militia or engaged in active military service or training, to privately possess and bear their own firearms ... that are suitable as personal, individual weapons and are not of the general kind or type excluded by Miller." Although liberals can be routinely counted on to distort the Constitution, they're generally more respectful of Supreme Court precedent, but this is mostly because the high court has so often ruled in their favor. When a decision doesn't go their way, it may be subject to the same sort of creative interpretation ... and why not? Like the Constitution, written Supreme Court opinions are made up of words. You know -- like "is," for example. The Court did not deny Mr. Miller's right to keep and bear arms. It only made the judgment, rightly or wrongly, that the sawed-off shotgun he was carrying didn't fall within the Second Amendment's definition of "Arms." Had he been carrying a common rifle or handgun, he'd have won his case. But all that those on the political Left will acknowledge is that Miller based his appeal on his right to keep and bear arms, and he lost. The determination that this result means that individuals have no right to own a gun is not derived from a logical process from premise to conclusion. Instead, it is simply inferred from a juxtaposition of incomplete information. This explains the Clinton-Reno interpretation of the Second Amendment as well. They see the words "a well regulated Militia," and then they see "the right to keep and bear Arms." In their minds, they erase all of the amendment except for those two points, then they redraw the connection between them any way they wish. Of course, the amendment doesn't say that you have to be in the National Guard to have a right to own firearms, but it's understandable how it might kind of feel that way. And as far as liberals are concerned, it's feelings that really count -- at least if you feel the same way they do.